There are ONLY 68 DAYS until Christmas, which means that Bex currently listens to Michael Buble’s Christmas album 24/7, discusses Christmas presents with her mom at least three times during a given day and cannot wait to start decorating for the holiday season. But, Bex should not jump the gun too soon (or is it already too late…?) because fall is still in full force! And we all know what that means: apples, spices and pumpkin basically embody their own food group. But when you get tired of the same old pumpkin spice latte and pumpkin flavored this-and-that, you need to switch it up a little, right? Let me tell you now, if you have not tried this new Chobani flavor then you are really missing out. It is the bomb. 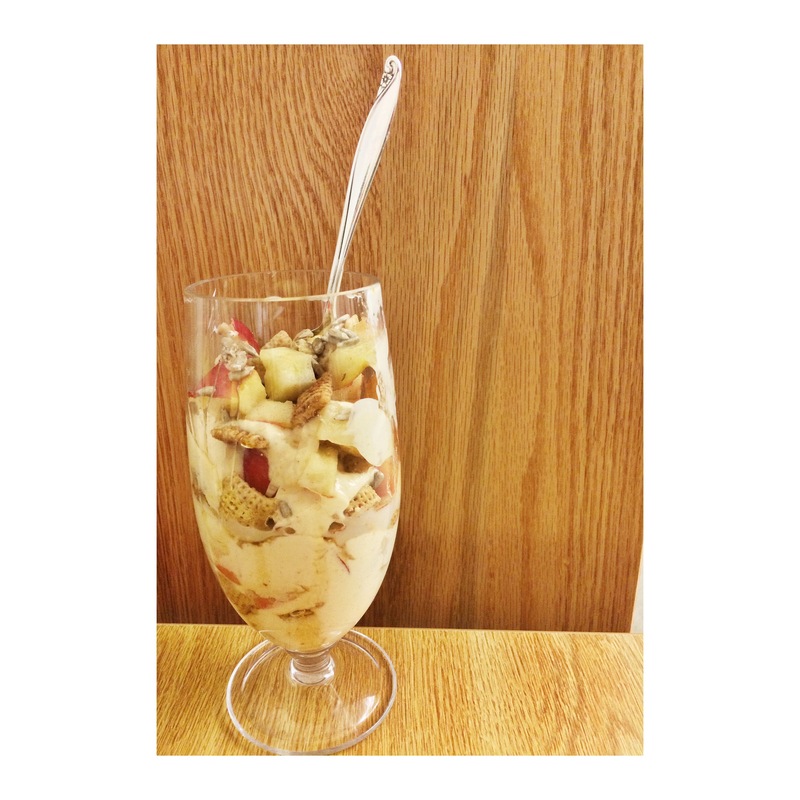 Make sure to grab one the next time you head to the grocery store in order to prepare this delicious parfait with honey, apples, and cinnamon chex. Then get ready to FALL in love. In a cereal bowl, combine apple chunks, chex, sunflower seeds, honey and a dash of milk. Mix well so that all pieces combine and partially stick together with the mixture of honey and milk. 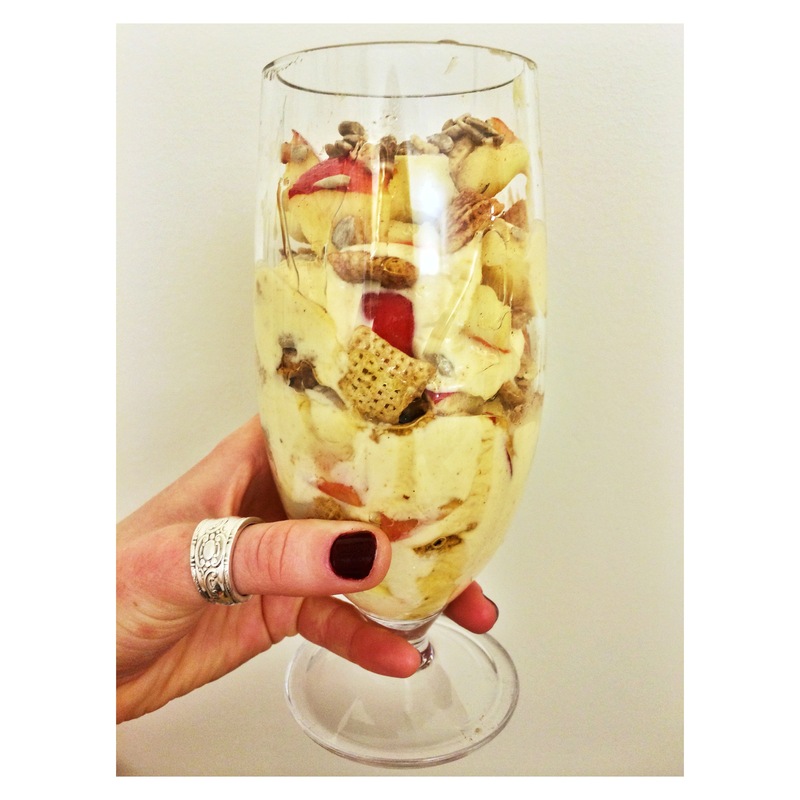 In a glass, layer the greek yogurt with the apple & chex mix. Bon appétit!